The iHeater is the environmentally safe and energy efficient infrared heater that can keep your family warm. Plus it can also help you save as mcuh as up to 50% on your next heating bill. This infrared portable heater is proven to use up to 50% less energy than most electric heaters or furnaces and reduce heating costs by 30% to 50%. iHeater can heat up to 1000 square feet evenly, regulate humidity levels, and even keep your floors warm. Since the iHeater uses infrared technology, the device itself is always cool to the touch even when it has been for hours. This makes it completely safe for kids and pets. Also, unlike other furnace and electric heaters, iHeater does not reduce the humidity or oxygen levels in the air. So you and your family can still breathe easy while staying warm. Plus it also operates quietly so you won’t be disturbed by loud noises. Using the iHeater is simple, you just turn the unit on and adjust the thermostat to the desired temperature. Since the iHeater operates for about $1 a day or less, you’ll can end up saving hundreds on your next heating bill. 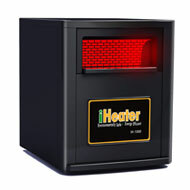 The iHeater has sold for as much as $499 but right now with this special offer you can get the iHeater for only $279, including free shipping and handling. What does it run on for power? Is it safe to keep on all the time even when sleeping or when gone? The iHeater plugs into a standard electrical outlet. It is safe to leave on for long periods of time. It uses between 500 to 1,000 watts depending on the settings.